Please place weekday orders by 6:30 pm to ensure availability for next-day drop-off delivery. Kindly give 72 hours notice for larger orders. After-hours orders may be accepted, but please be sure you receive an email confirmation by the morning of the event. If you have not received a confirmation by 9 am, we may not have your order (please add our email address to your list of approved senders). Please review the confirmation carefully. All the information on the confirmation is the actual order detail on file, including time of delivery and address. If anything is not 100% correct, please notify us immediately. Our normal window for accepting orders is Monday through Thursday 7am – 6:30pm , Friday 7am – 3pm, and Saturday/Sunday 9am – 4pm. Weekend and after-hours calls are sent to voicemail for later response. If we can accept the order, we will confirm the next business day as early as possible. Please note that we may not be able to accept late orders because of a limited number of delivery personnel, but we do our best to fill every request. Keeping in mind that your food is always made-to-order, please contact us immediately if it becomes necessary for you to cancel an order (by phone if possible, especially for same-day cancellations). An order that has been confirmed as cancelled prior to its associated cancellation deadline will not subject the customer to any cancellation fees. A customer who cancels an order after its deadline will be charged a cancellation fee equal to 33% of the invoice total (minus delivery charges), regardless of the reason for cancelling. Please note that if a canceled order required us to make extraordinary purchases or make special arrangements with outside suppliers, those items will be billed to the customer at our cost plus handling charges, irrespective of the deadline being met. However, we also reserve the right to reduce or eliminate cancellation fees associated with items which can be used in our normal course of business (e.g., beverages). Cancellation notice deadlines listed below are relative to an order’s scheduled pickup or delivery time. On-site catering is available and requires a minimum notice of 5 days. Saturday & Sunday orders must be placed no later than the preceding Wednesday and meet a minimum subtotal of $200 (not including taxes or fees). Large events may require a deposit of 50% (non-refundable if canceled less than 72 hours prior). Our minimum order for delivery is $100 (not including taxes or fees). All delivery orders will incur a delivery fee, so no tipping is expected or necessary. For orders under $300, the delivery fee will be the greater of 60 cents per mile (measured from our site to your delivery location and back) OR 15% of the food total (min. $15 delivery fee). For orders over $300, the delivery fee will be the greater of 60 cents per mile roundtrip OR 10% of the food total. 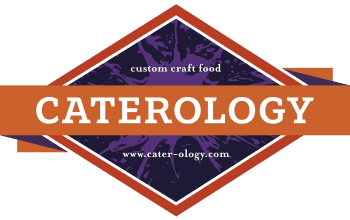 For deliveries made within a 10 miles radius of Caterology, the delivery fee is capped at a maximum of $35. On-site staffing is available for your special event, including servers and chefs, at the rate of $18/hour per server and $25/hour per chef (minimum 3 hours per staff member). Please note that this rate applies from “door to door,” including driving time to and from your event. Some frequent users may qualify for a rebate. In order to qualify, you must spend a minimum of $500 per calendar month (not including fees or taxes). If you do not meet the minimum purchase requirement for a month, it can not be added to the next month. Eligible members may receive 5% back on their qualifying purchases in the form of a Visa Gift Card. Qualifying rebates must be requested within 12 months of the initial purchase date.